The holiday season is a time for elaborate feasts and festive decorations. These decorations require effort and planning. There are also risks associated with hanging holiday decorations. Below you’ll find five tips for decorating for the holidays safely. There are many decorating tasks that are safer with two or more people assisting, especially those involving a ladder. Instead of attempting to take on all the decorating yourself, ask some family members to help you. Have everyone look through all the string lights for frayed wires or broken bulbs and discard any defective strands. 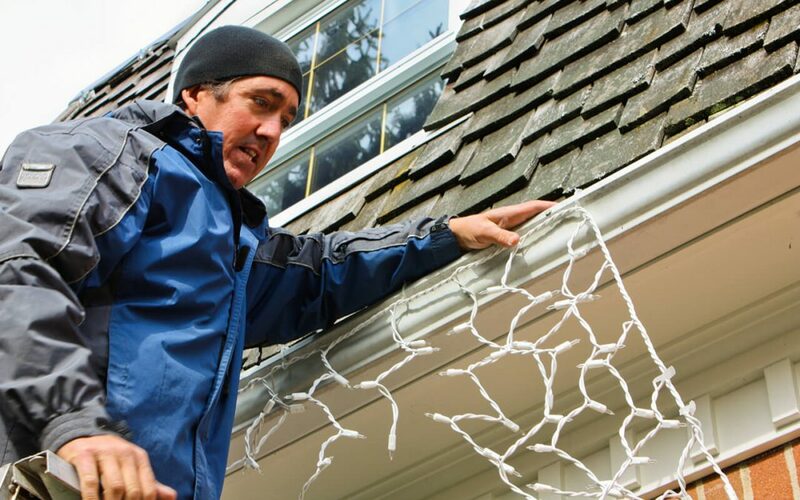 When hanging Christmas lights, have one person keep the ladder steady and another hand you items. The holidays are a time for sweet treats and decoration manufacturers know this. Many ornaments and decorations are out there resembling gingerbread cookies, candy canes, and berries. Young children and pets don’t realize that these decorations are not edible and they can be a toxic choking hazard if ingested. When shopping for holiday decorations, avoid purchasing decorations that look like food. Common holiday decorative plants include poinsettias, holly, and mistletoe. While these plants are gorgeous with the red and green of the holiday season, they’re also toxic to both humans and pets. For homes that don’t have children or pets, decorating with these plants is relatively safe. Decorating for the holidays safely means keeping these plants out of your home or placing them well out of reach of children and pets. You may find out that many of the cords to your favorite decorations aren’t long enough to reach the electrical outlets. For this reason, many families use extension cords. While using extension cords is acceptable, there are some safety protocols to follow when you’re decorating for the holidays safely. Extension cords can only hold a certain number of plugs and use a specific amount of electricity. Make sure you read the instructions for your extension cords and follow them. If your family chooses to get a real tree to decorate for the holidays this year, remember to keep it watered. A dry Christmas tree is more of a fire hazard than a moist, healthy tree. Check to see if the tree is hydrated enough by bending one of the branches and shaking the tree. If the branch snaps or needles fall off, your tree is too dry and needs more water. Veriguard Home Inspections wishes you a happy and safe holiday season. We offer home inspection services to Northern New Jersey.